For twenty-five years Bechdel’s path-breaking Dykes to Watch Out For strip has been collected in award-winning volumes (with a quarter of a million copies in print), syndicated in fifty alternative newspapers, and translated into many languages. 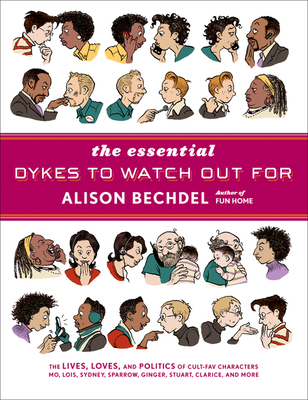 Now, at last, The Essential Dykes to Watch Out For gathers a “rich, funny, deep and impossible to put down” (Publishers Weekly) selection from all eleven Dykes volumes. Here too are sixty of the newest strips, never before published in book form. Settle in to this wittily illustrated soap opera (Bechdel calls it “half op-ed column and half endless serialized Victorian novel”) of the lives, loves, and politics of a cast of characters, most of them lesbian, living in a midsize American city that may or may not be Minneapolis. Her brilliantly imagined countercultural band of friends -- academics, social workers, bookstore clerks -- fall in and out of love, negotiate friendships, raise children, switch careers, and cope with aging parents. Alison Bechdel is the author of the bestselling memoir Fun Home: A Family Tragicomic, which was named a Best Book of the Year by Time, Entertainment Weekly, New York Times, People, USA Today, Los Angeles Times, Village Voice, and San Francisco Chronicle, among others. For twenty-five years, she wrote and drew the comic strip Dykes to Watch Out For, a visual chronicle of modern life—queer and otherwise—considered "one of the preeminent oeuvres in the comics genre, period." (Ms.) Bechdel is guest editor of Best American Comics, 2011, and has drawn comics for Slate, McSweeney's, Entertainment Weekly, Granta, and The New York Times Book Review.